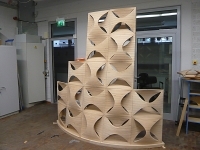 The “WovenWoodWall” is a research project, that was created as a spin off out of the previous design studio “ContinuumStructures”. 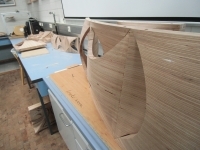 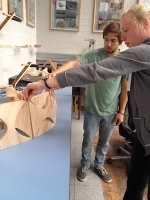 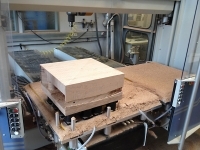 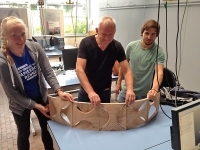 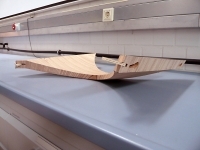 The work is set up as a collaborative interdisciplinary investigation between the IMD and the HAWK Hildesheim, which is delivering the knowledge and resources in the area of wood construction and fabrication, especially large-scale 5-axis-milling. 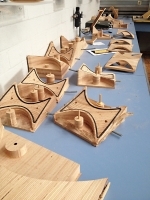 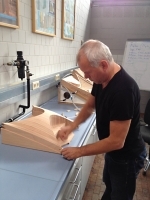 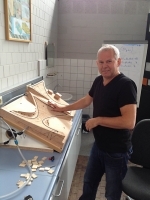 Furthermore Dr. Markus Hudert from the ITE contributed his specialist knowledge in the area of contemporary digital fabrication and wood construction. 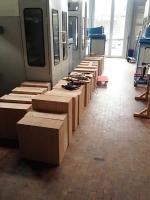 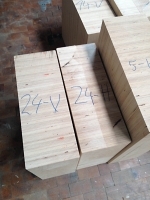 The wood manufacturer Pollmeier generously supported us with the needed raw material. 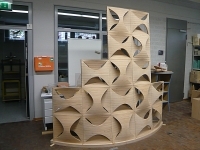 The main research objectives was to materialize one of the previous wall designs in wood consisting of 25 individual modules, that would allow for a simple stacking logic that at the same time would create a self supportive structural system. 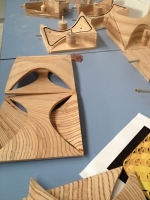 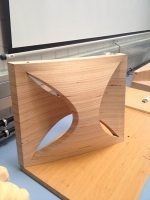 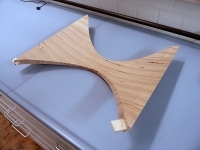 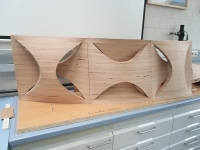 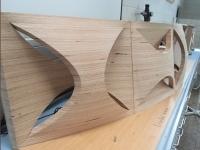 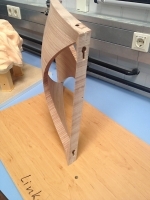 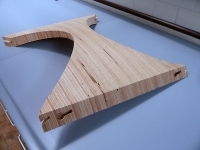 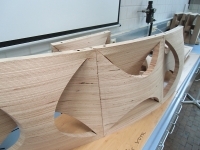 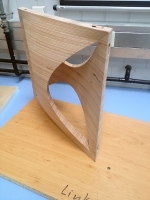 For the connection of the individual panels traditional wood construction methods such as dovetail joints were investigated to achieve the goal of a simple non-visible and preferably embedded option. 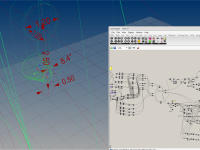 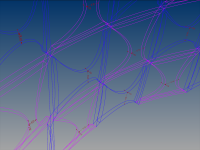 The whole project was set up parametrically in Rhino Grasshopper, to allow for precise control during the design process and a high degree of flexibility in terms of fast digital model update management during fabrication phase. 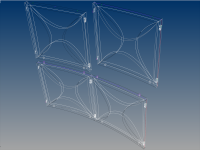 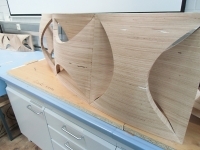 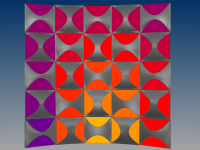 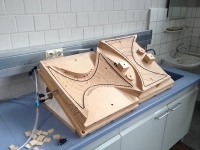 The usage of a fully parametrically drawing environment, allowed for the precise real time altering and control of the 25 double curved modules, that consist of two individual parts each.The implementation of a computationally controllable design environment, was especially useful to create the internal sliding joint connection system, that was needed to assemble the double curve modules on the single curved overall surface. 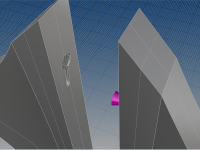 Due to the fact, that each element is geometrically different, in accordance to its local position within the wall-system, angle derivations of up to 10 degrees occur between the modules centerline and the vertical sliding direction implemented as an aligned path of movement valid for all elements. 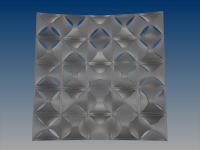 A high radiation value resulted in a flat module with a wide ridge, and a high wall thickness to let as less sun through as possible, for the low value case it would be the opposite. 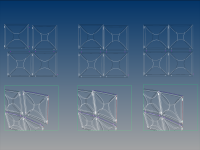 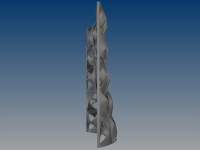 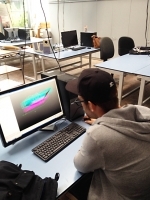 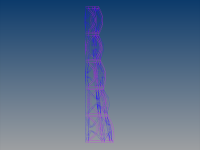 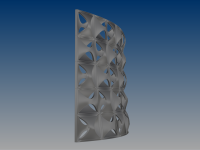 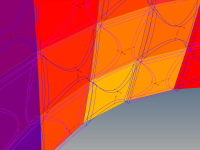 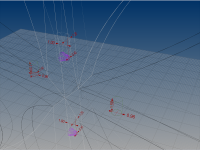 Therefore each module has a customized geometric appearance, which is the direct result of the simulation data which was parametrically linked to the 3D Model. 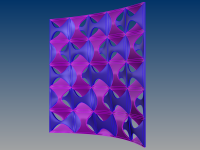 Consequently the overall gradual porosity of the screen is thus not a random choice, but directly influenced by the extracted simulation values.